Allen Stewart is a trial attorney for Allen Stewart, P.C. where they are passionate about helping people harmed by others. 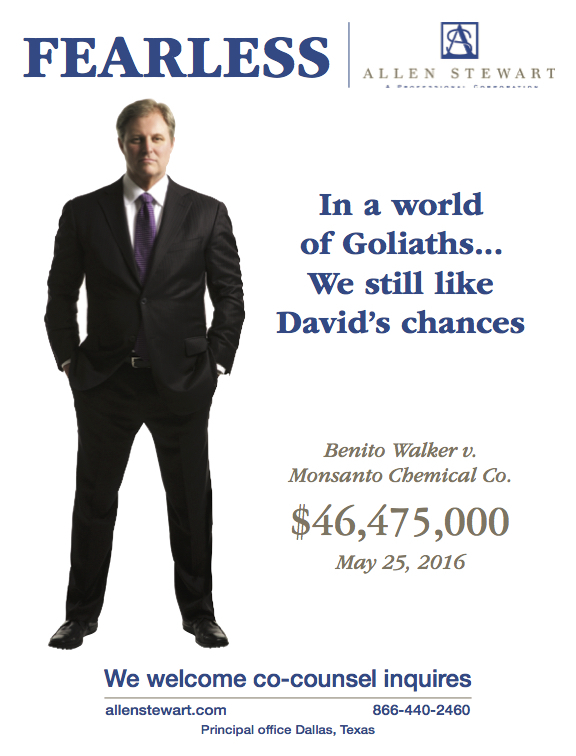 He recently won the verdict against Monsanto Chemical Co. on May 25th, 2016 which awarded $46,475,000 to the three plaintiffs. The claim was that Monsanto was aware of a link between polychlorinated biphenyls (PCBS) and non-Hodgkin lymphoma, yet they continued to market the chemical compounds as safe until the EPA banned the use of PCBs in the later 1970s. Allen came to me to capture a strong, clean image that he could use for his advertisement in the National Law Journal, where his verdict was listed as one of the top 100 verdicts of 2016. I’m so happy with the way it turned out.